Elm Heights, the historic neighborhood on the south side of the Indiana University campus is always popular for its location and architecture. 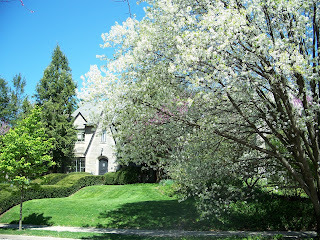 And spring in Elm Heights is simply beautiful. The photo to the right was taken on First Street. 1040 E. Maxwell Lane is a unique home whose original structure is a 1957 Lustrum home. It now has 5 bedrooms and 2 full baths. The floor plan in non-traditional but very interesting. Priced at $285,000. 1212 E. First Street is a California ranch that has been fully renovated and is located on one of the areas most lovely streets. It has 5 bedrooms and 3 full baths and is priced at $549,900.